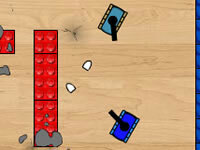 Description: Winter Rage Blast is an intense shooting game with huge and powerful tanks. Your mission is to destroy everything that stands in your way.. Operation Winter Force is a Tank Games. Instructions: Drive your tank using the arrow keys. Press W to rise and S to lower the cannon. Press D to shoot..